Checking the weather online is fine and all, but having a dedicated weather station? That’s a whole other ball game. Imagine it – you wake up in the morning, glance over at it and immediately know everything you need to plan your day. Plus, they generally display much more detailed information than the weather reports do, so if you like statistics, they really are the perfect item to have around. 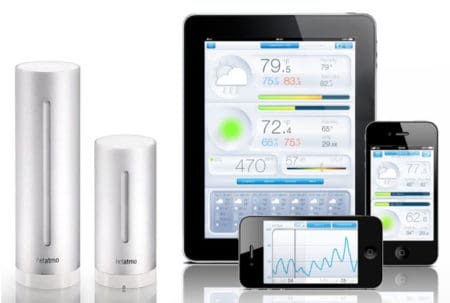 We’ve scoured the market for some of the very best wireless weather stations around and compiled them into this list so that you don’t have to. This lets you spend less time researching and more time in the garden (assuming the weather allows, of course). In the table below, you’ll find the name of each product we’ll be reviewing, as well as a couple of its relevant features. There’s more to come, so don’t go making a decision just yet! Now it’s time to take a closer look at each of our top recommendations. Not all weather stations are alike, so we’ll be explaining their strengths and weaknesses, as well as finding the person each product would suit best. 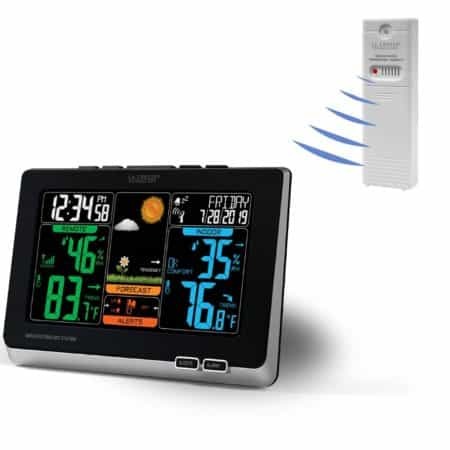 Without further ado, let’s begin with the least expensive product, the Blackshark Wireless Weather Station. Just because something is inexpensive, that doesn’t mean it’s not good. There’s no truer example of this than the Blackshark Wireless Weather Station. It retails for around 30 USD, yet provides a service that’d be very useful to anyone who likes gardening or just relaxing outside. The outdoor sensor needs two AAA batteries (not included) and wirelessly transmits all kinds of information up to 330 feet to the indoor sensor. You can keep track of the current temperature (in either Celsius or Fahrenheit) and humidity, as well as the dew point and barometric pressure, and it even shows the pressure history so you can see any trends. There is also, of course, a weather prediction, although it’s fairly basic and can only show rainy, cloudy or sunny weather. The indoor unit comes with a foldable stand at the base and measures just 7.25” long, 4” wide and 1” thick. It can be mounted to a wall if you’d like, although since the screen isn’t backlit, you will need a light source to be able to see it clearly. It requires two AA batteries and unfortunately can’t be plugged into an outlet, although when the batteries are running out, an indicator will appear on the screen so you won’t wake up one day and wonder what’s wrong with it. The clock has to be manually set, which isn’t a huge problem, and you can set an alarm if you’d like to keep this by your bedside. There’s even a snooze function for those days when you want to lie in for a while. It automatically adjusts itself for daylight savings time too, so you can just set it up and forget about it. On any given day, you can view the sunrise and sunset times, as well as the moon phase. If we had to find an issue with this product, it’s that the date is fixed in the day/month/year format and can’t be changed. This is fine if you live in Europe, but for American users, this might be a little annoying. Also, we’d have liked to see some mains power support – this weather station needs two different types of batteries and an outlet would have really made things simpler. All things considered, though, it’s a great little station. If you want to use it as an alarm clock, you can, but it really comes into its own where the finer details of the weather are concerned. We liked the ability to view the trends in barometric pressure and knowing the time of the sunset adds a small degree of predictability to your day so you can plan around it. If your budget is tight and your weather needs light, choose Blackshark. 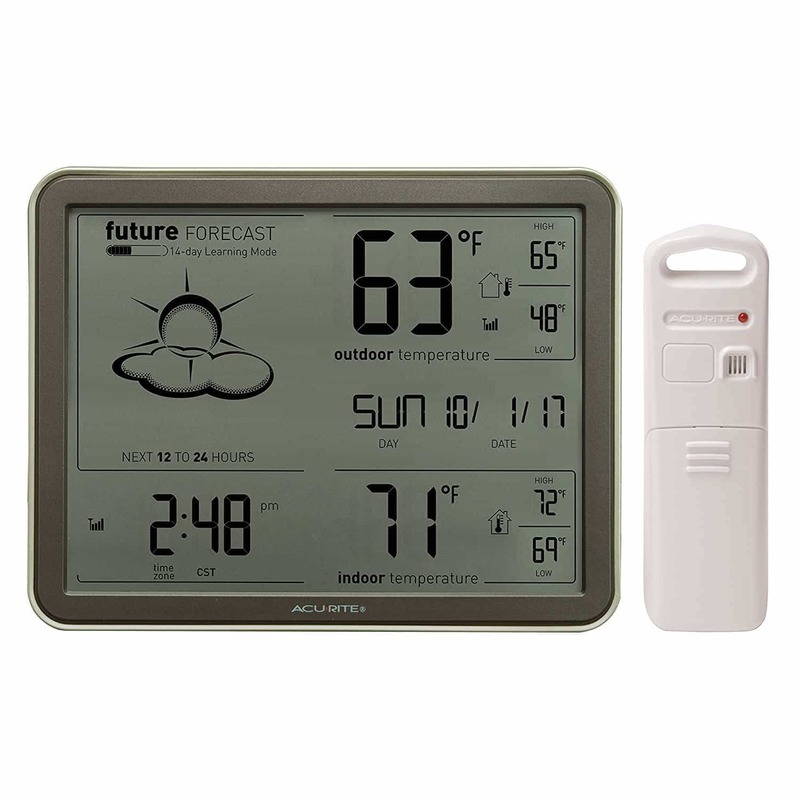 A little more expensive than the last model we reviewed (around 35 USD), the AcuRite 75077 Weather Forecaster offers quite a bit more information about your environment. This makes it perfect for gardeners, groundskeepers or even just the inquisitive, since tracking weather trends has never been easier. 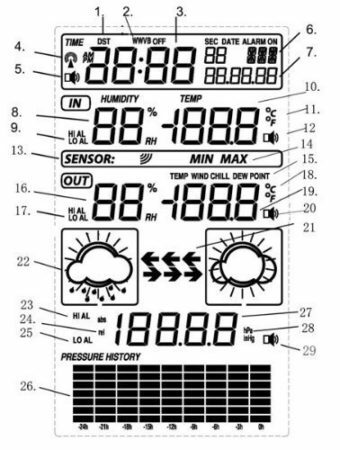 This unit tracks a whole range of things: temperature changes, the humidity, barometric pressure, you name it. Better still, it uses advanced technology to slowly learn what altitude you are at over the course of fourteen days to make its weather predictions more accurate. A lot of stations track 101 different things and squeeze all the information together, but the information on this model’s screen is spaced out nicely and displayed in a clear, easy to read way. Both the indoor and outdoor temperature are displayed, as well as the highest and lowest temperature for that day so far. This can be switched between Celsius and Fahrenheit with the click of a button. There’s an atomic clock in this model. That means that you don’t have to set the time, it just knows it. There’s also no risk of it running slowly or too fast – it’ll keep the time within a fraction of a second for as long as you have it and it even accounts for daylight savings time. You also have the option of switching between 12 and 24 hour time, which is nice. The screen on the indoor sensor is very large at 6. This makes it easier to see the most important information and is great for people who can’t see all that well. The screen isn’t backlit, so make sure you put it in a place with a lot of light. You can use the hanging hole in the back to mount it on a wall the same way you’d put a normal clock up – no screws, no fuss. Unlike the last product we saw, this one uses the same batteries for both sensors. In all, you’ll need five AAs (two for the outdoor sensor, three for the indoor), but again, there’s no option to use mains power. There is a light on the unit that shines when the battery is running low as a reminder to replace them before they die. This is because it’s easy for an icon to blend in on a screen, but if there’s a bright light shining at you, you’re sure to notice it. Despite its low cost, the manufacturer provides a full year’s limited warranty. This means that if anything arrives broken or stops working, as long as it isn’t your fault, they’ll replace it for you. It’s nice to know that they aren’t just trying to take your money and leave, especially when it’s likely to be mostly older people who’ll use this product. The last two models were great but shared the same flaw: they relied on batteries instead of mains power, meaning they had higher running costs. The La Crosse Technology C83349 addresses this issue and doesn’t just adopt mains power – it also keeps the batteries so the product doesn’t turn off in the event of a power cut. The outdoor sensor uses two AA batteries, but the batteries alone aren’t enough to support the indoor unit for long. It needs power from an outlet for regular, everyday use. Since electricity costs less than batteries over time, this actually works out better in the long run, and the ability to keep the unit running when the power goes out is a nice bonus. You can view both the indoor and outdoor temperature using the indoor unit. It keeps track of the highest and lowest values for the day, and also the humidity. These can be viewed in whichever measurement you’d prefer. You can choose to set an alert for various conditions: say you want to know if it’s getting too hot outside, you just set a temperature alert and the unit will make a sound to keep you informed. This gives you a chance to turn on your sprinklers and protect your plants from harm. The clock on this model sets itself – it’s atomic, so it might take a few hours until it displays correctly, but once it does, you’re good to go. You can toggle between 24 and 12 hour time and it automatically adjusts based on whether it’s daylight savings time or not. You can also set the backlight to be on all the time, or only when you press a button. This second option is great for conserving the battery power, but the first is better if you want to just be able to glance over at the unit. The unit can also be mounted to a wall using the three screw holes on the back if you want it to be a more permanent fixture. This is a decently sized weather station, with a screen that’s 8” wide and 5.5” tall, so it’s one of the easier models to read. Overall, this is a strong little wireless weather station. It shows all the important information without any of the irrelevant things a lot of others throw in. Its clock never fails, and thanks to the dual power design, neither does it. The alerts will be invaluable for anyone with plants which are sensitive to heat (at either end of the spectrum) and the fact that the screen is backlit makes it easier to see at night. This product is a bit more expensive. It retails for around 130 USD, but it justifies this higher cost by offering much more versatility and a larger scope for customisation. You can actually combine several of these units to form a very advanced network, but for the purposes of this list, we’ll be reviewing one unit only. This model measures everything. Your usual suspects like temperature and humidity (both inside and outside the home) are accounted for, as are some less commonly seen aspects such as barometric pressure, the concentration of carbon dioxide in your home’s air and even the noise level. You get free lifetime storage for this data, and it can be viewed either as raw numbers or in graph form. You can even receive alerts to your mobile phone or PC when certain conditions are met. You can, for example, be alerted when it rains in your garden so that you don’t water the plants later that day. 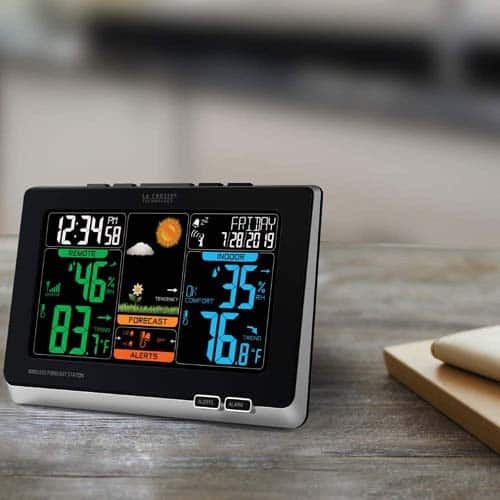 As long as you have a PC with an internet connection, iPhone or a device running Android 4.0 or later, you can use this weather station. If you’re lucky enough to have an Amazon Alexa, you can even ask it to check the station for you – just phrase it as a command, e.
“Alexa, ask Netatmo if it’s rained today”. The online connectivity is a huge benefit over more traditional models since you can check the status of your home or garden from anywhere in the world. The outdoors unit is powered by two AA batteries, and the indoor one can be powered either via USB or wall outlet. This leads to lower running costs, but given the higher initial investment required, that’s little comfort. 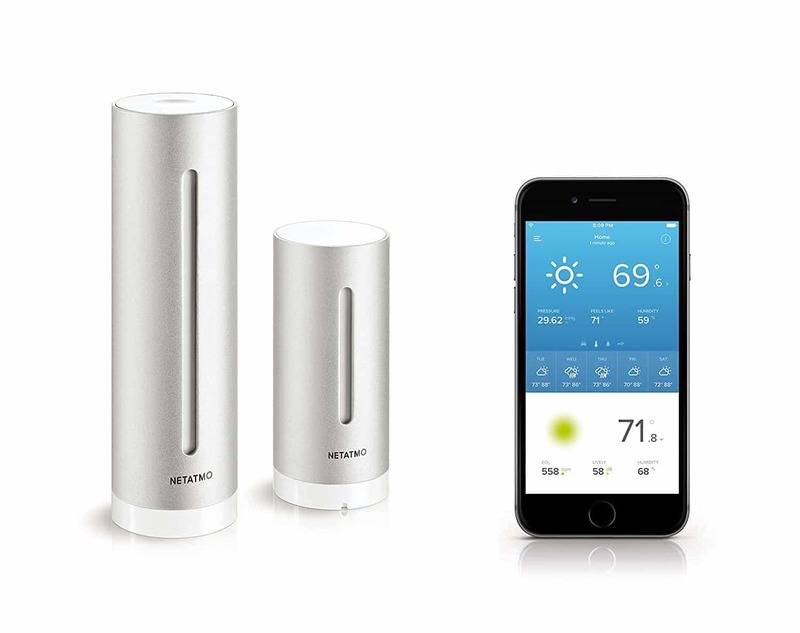 That said, it does seem to earn its place – it’s not only a weather station but can actually define the quality of your air, after all. It’s also worth noting that the outdoors unit is fully weatherproof and won’t stop working if it gets too cold out. When you take into account the level of versatility this product has, it becomes obvious that it’s going to cost more money. Whilst this unit is likely overkill for most people, for those who like to monitor their environments more closely, this is one of the best you can get. It has a price considerably lower than that of the more advanced weather stations. If you can’t justify the price of a super-fancy weather station this one might be a little more palatable. This is definitely one of the higher end products available. It retails for a little over 300 USD but has a level of functionality which is unmatched by any of the lower cost models. This weather station is designed to work with minimal user intervention, unlike others which need a periodic battery replacement. The indoor unit is powered via a standard outlet and while the outdoor unit is solar powered, it also requires three AAA batteries. Why? Well, it uses the batteries for power, but recharges them with solar energy, ensuring that you only have to manually recharge them once a year or so. In the same vein, the rain catcher automatically empties itself so it only requires very infrequent cleaning. This unit measures the temperature, humidity and barometric pressure of the inside of your home, and all of that, plus wind speed, direction, rainfall, UV and solar radiation levels for outdoors. This data is used to create an easy to read graph and stored online so that in the event of a power cut, most of your data is saved. You can also use an SD card to store the data locally if you like. The sensor updates its readings every 14 seconds so that it doesn’t miss a thing. Every gust of wind will be accounted for and easily analysed later. You can even add a camera to the outdoor sensor to capture images and video – when combined with the alert system, this turns your weather station into a basic motion detector or CCTV camera. There is a lot of information crammed onto a relatively small display, so it appears a little cluttered at times. It is backlit, so it’s easy to see in the dark, but we can’t help but compare it to the less expensive models with much neater interfaces. This could have been fixed by pressing a button to display certain data points instead of showing it all at once. Also, the clock needs to be manually set, whereas there are 40 USD models with atomic clocks included. This model is a very data-driven weather station. We liked that there were multiple ways to store the recorded data and the self-recharging battery system is absolutely fantastic. For all its successes, there were a couple of noticeable shortcomings, namely in the display and clock, but these are merely annoying and don’t affect the functionality in any way. 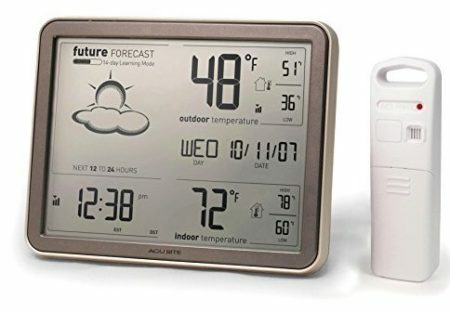 On the whole, this weather station is pretty great, and if you have some money to spare, it’s definitely worth trying out. 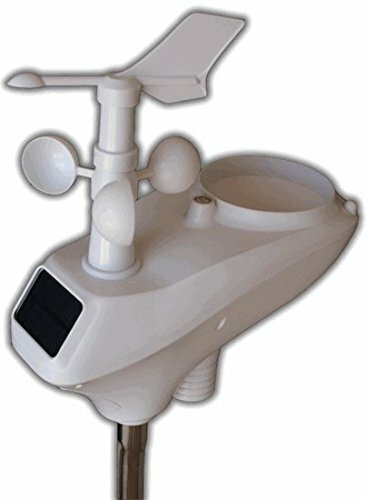 How To Choose The Right Wireless Weather Station For Me? 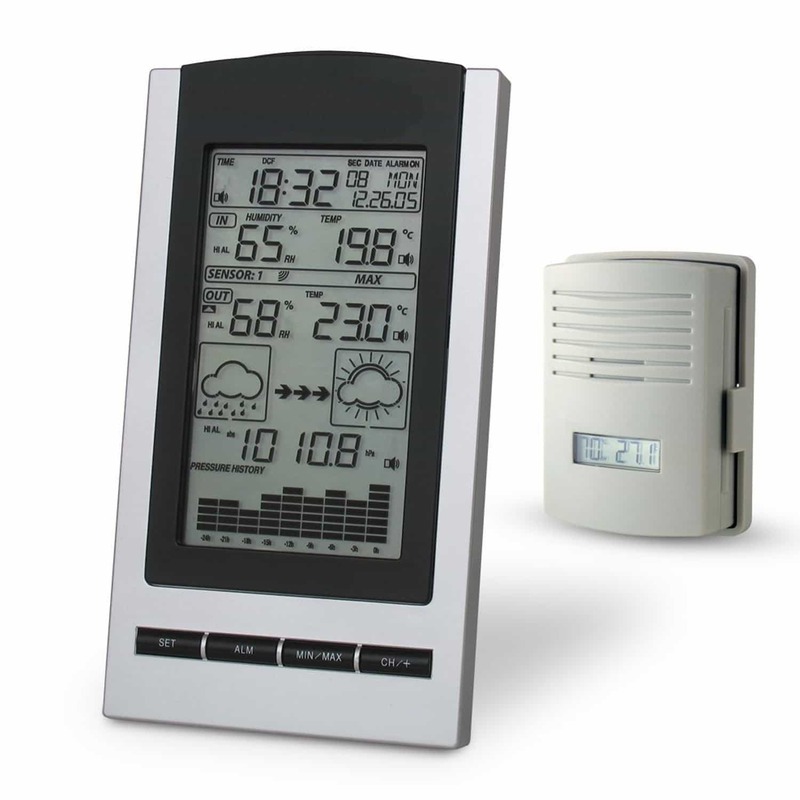 Buying an outdoor weather station doesn’t have to be difficult. Even though the name makes them sound very scientific (and they are, really), comparing them is actually quite simple. We’ve put together a short guide to teach you what to look for before spending any of your money with the goal of helping you find the best weather station for your needs. More isn’t always better. 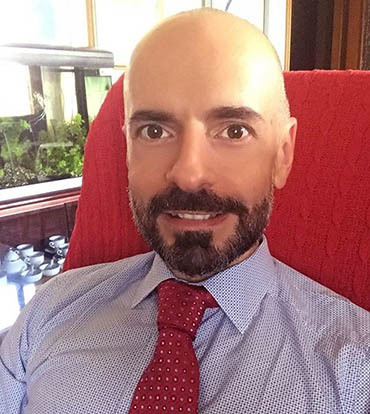 Low-cost models will generally offer the temperature, humidity and a weather forecast, whereas expensive products throw every metric you can think of at you. Do you really need to know your current altitude? What about UV levels? If you’re really interested in this stuff, sure, go for it, but most people will be fine with just the basics. Also, pay attention to how the data is displayed. Is it all crammed together on one screen? Is it neatly spread out? Is it labeled? The last thing you want is to prepare for gale force winds, just to realize you were looking at the wrong number. If you’re unsure about what any of the data actually means and want to know more, there’s a great little article here that explains things nicely. How are the units powered? The outdoor sensor almost always needs batteries, but they might not even be the same type as the indoor sensor. For the lowest running costs, try to find an indoor unit that plugs into the mains. Many mid-budget models even use batteries as a backup when all else fails, and if you’re serious about data collection, you’ll probably want one of these. Better still, if your outdoor station uses green energy like solar or wind power, it will be almost self-sufficient. The downside is that these models tend to be a lot more expensive, so you don’t actually save that much money, but at least you don’t have to replace the batteries as often. Are you a hard-core data analyst or do you just want a clock that has a weather forecast? If the former, consider getting a model which connects to a cloud-based storage system. This way, if there’s a power cut, all of your data is safe. If you’re the latter, you’ll want a model with a nice, clear display, possibly one that can be mounted on a wall. Pay attention to the clock, too. These come in two types: manual or atomic. The manual kind needs to be set at the right time and adjusted if the clocks go back or forward, but the atomic ones do this automatically by measuring the vibrations of atoms. These can sometimes take a few hours to get the time right, but once they do, they’ll be correct (give or take a second or two) forever. If you’re a keen gardener, look for a station that lets you set alarms. These can be used to let you know when weather conditions reach a problematic level. You could, for example, set it to alert you when the temperature nears freezing. This would allow you to take vulnerable plants indoors or even turn on an outdoor heater before any damage was done. If your eyesight isn’t what is used to be, try to get a model with a large display, backlit if possible so that you can still see the numbers clearly in dim lighting. 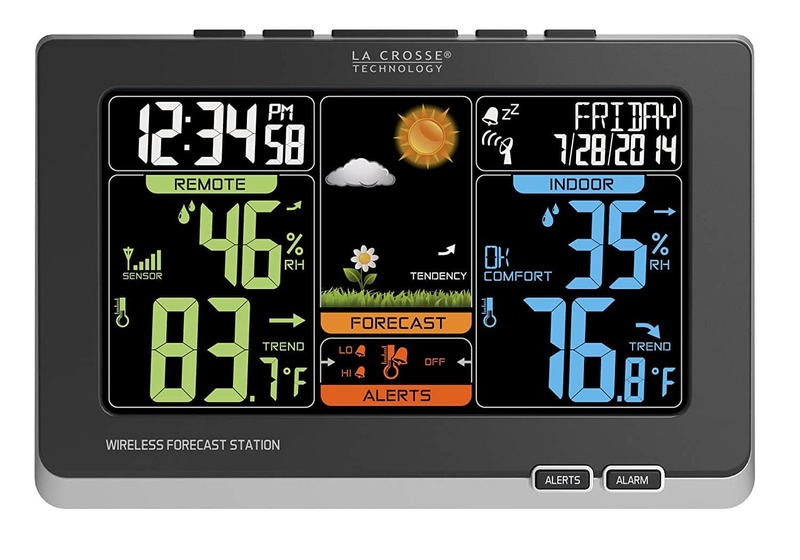 We’ve covered a range of wireless weather stations – one to fit every price range, in fact, and whilst they all have their strengths, we’ve decided that the best overall is the La Crosse Technology C83349. It has a backlit screen, clean display and even a backup power system in case of a power cut. Add to this the fact that it’s very affordable and accurate, and it becomes clear why we like it so much. 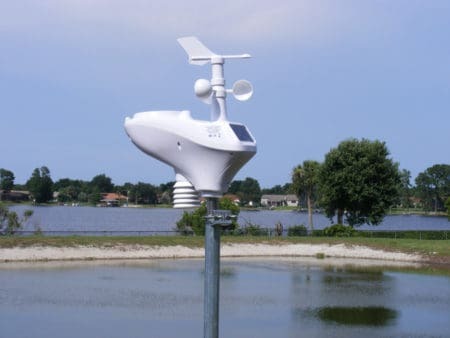 The fact that it doesn’t cost much makes it very appealing to people looking to get into the world of weather watching, and although the data is a little sparse, it’s a great starting weather station. Thanks for taking the time to read this article – we hope that you’ve found it helpful. If so, we’d like to ask you to consider leaving a comment or a rating since we take all of your feedback into account and it’d help us tailor our future content to suit you better. We’ll go now since rain is forecast… but you already knew that, didn’t you?